Grundy Electric is a non-profit corporation owned by the members it serves. Like any sound business, we must maintain a margin to assure financial stability. Funds collected in excess of actual expenses are accumulated in the form of Capital Credits. A portion of this margin represents the member's or former member's equity in the cooperative. Our bylaws require us to notify each member of their portion of this margin (Capital Credits). 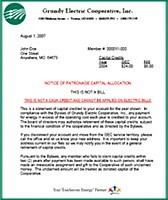 Grundy Electric mails Capital Credit allocation notices, informing members of the amount of credit accrued. Capital Credits are paid periodically with board approval after review of the cooperative's financial status. Capital Credits are unique to cooperatives. The amount of your allocation is based on your patronage; the more electricity you buy, the greater your share of cooperative margins. After being notified by heirs of a deceased member, the cooperative will refund Capital Credits to the member's estate. The second method of refunding is referred to as a general retirement. Each year the Cooperative's Board of Directors vote whether to approve a general retirement. For more information regarding Capital Credits, please contact Sandy Browning at sbrowning@grundyec.com or extension 10.